The candles added an interesting, if not dangerous, romantic touch to the wedding day, don't you think?! On March 5, 1994, I received way more than I could ever deserve. Why Kathy fell in love with me and why she said yes to marrying me will always be a marvelous mystery to me. Kathy and I really are having a hard time believing that we have been married for seven-thousand-three-hundred-five days (including the 5 leap year days). Makes no sense! We must have gotten married when we were seven years old! We still feel like young pups all wide-eyed and wondering about our hand-in-hand future together. 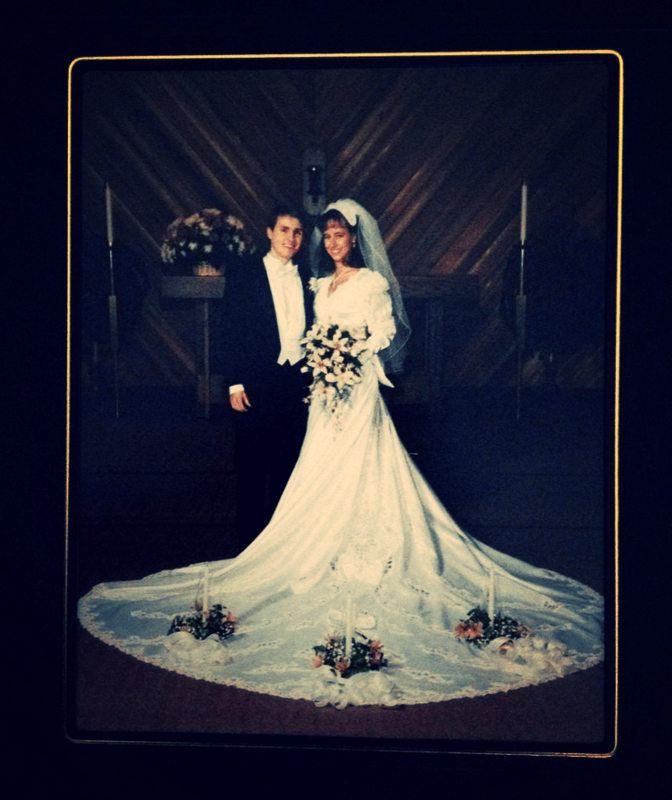 I still remember our wedding: Kathy's poofy hair and the long train of her dress… and that for some strange reason we put candles on her train for a photo…and I especially remember her smile (which melts me today as much as it did then). She was then, and is now my favorite person in the world— I can't believe God blessed me with 20 years to be by her side. I pray God blesses me with many many many more. Kathy, to quote our favorite cheesy-mullet-inspired-rock-ballad-date-night-love-song of the early 90s: "I'll be yours until the sun doesn't shine, til time stands still, until the winds don't blow…"